Soul Serenade: The Manhattans, "There's No Me Without You"
It’s the middle of that strange week that comes between the Newport Folk Festival and the Newport Jazz Festival every summer. At this point in the week I’m nearly recovered from the first three-day festival, and beginning to gear up for the second. I’m also preparing to immerse myself in music that is, for the most part, completely different from what I heard last weekend. But it’s all music, and I love it all. All of this has nothing to do with the Manhattans, and their particular brand of “folk” music. They got together in Jersey City in 1962. The original lineup was comprised of George “Smitty” Smith, Sonny Bivins, Blue Lovett, Wally Kelley, and Ricky Taylor. They went to different high schools, but after graduation all five men enlisted in the service. The group came together after they were all discharged. In 1964, the first Manhattans single was released on Carnival Records. They continued recording throughout the ’60s and while they didn’t have any massive hits, their singles reliably found spots in the Top 25 on the R&B chart, at the same time finding somewhat lesser success on the pop chart. This run of singles included titles like “I Wanna Be (Your Everything)” (#12 R&B), “Searchin’ For My Baby” (#20), “Follow Your Heart” (#20), “Baby I Need You” (#22), and “Can I” (#23). Tragedy struck the group in 1970 when Smitty Smith fell down a flight of stairs. His injuries prevented him from performing, and he passed away in December of that year. A search for a new singer resulted in Gerald Alston, the nephew of Shirelles lead singer Shirley Alston-Reeves, joining the group. With Alston out front, the Manhattans finally had a big hit with “There’s No Me Without You” in 1973. The record ran all the way up to #3 on the R&B chart, and nearly hit the Top 40 on the pop chart. Follow ups that included “You’d Better Believe It,” “Wish That You Were Mine,” “Don’t Take Your Love,” and “Hurt” performed well. But the Manhattans biggest hit, the song that they will be remembered for, hit the #1 spot on the both the R&B and pop charts in 1976. The RIAA introduced the platinum record award that year, and “Kiss and Say Goodbye,” written by Blue Lovett, was the second record to ever receive it. That same year also brought sadness however, as Ricky Taylor left the group to pursue his conversion to Islam. 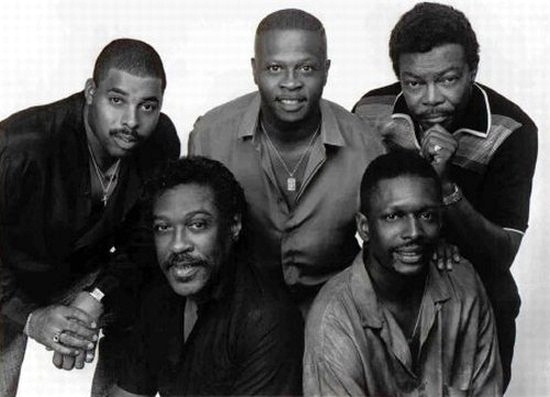 The Manhattans continued as a quartet, and the hits continued with “I Kinda Miss You,” “It Feels So Good to be Loved So Bad,” and “We Never Danced to a Love Song.” Then “Shining Star” hit big in 1980, going Top 10 on both the R&B and pop charts, and winning a Grammy Award. Success continued for the Manhattans throughout the ’80s. “I’ll Never Find Another (Another Like You),” “Just One Moment Away,” “Crazy” and “You Send Me” were all strong performers on the R&B chart. In 1988 Alston left the group for a solo career, and had several big hits on his own. Roger Harris was brought in to replace him. Then in 1990 Blue Lovett left for health reasons, and Wally Kelley decided to go back to college for his PhD. Sonny Bivins and Roger Harris soldiered on with a revolving cast of Manhattans. The group was still out there at the start of the new century. In fact, there were two groups of Manhattans on the road. One was led by Bivins, and the other by Alston and Lovett. To add to the confusion, both groups released albums during this period, with the latter unit appearing on the Wu-Tang Clan album 8 Diagrams. Ricky Taylor passed away in 1987. Founder Sonny Bivins and songwriter/bass singer Blue Lovett both died in December of last year. Wally Kelley was the only surviving original member of the group until his death in February of this year. Gerald Alston remains the only survivor of the Manhattans’ peak years. The Manhattans’ sweet sound, as the world knew it and loved it, is gone. Their music lives on.